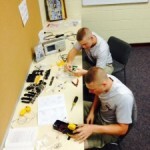 The Fishburne Military School postgrad basketball team, coming off back-to-back appearances in the National Prep Championships, will be returning to New Haven, Conn., in November to begin its bid for a third straight national-tourney run. 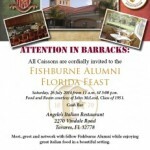 Saturday 26 July 2014- Join host John McLeod, Class of 1951, for the FMS Florida Alumni Feast. The festivities will begin at 11:00 a.m. Enjoy great food & company, meet greet and network with fellow Alumni.